James Caleb "Cale" Boggs (May 15, 1909 – March 26, 1993) was an American lawyer and politician from Claymont in New Castle County, Delaware. He was known by his middle name. He was a veteran of World War II, and a member of the Republican Party, who served three terms as U.S. Representative from Delaware, two terms as Governor of Delaware, and two terms as U.S. Senator from Delaware. Boggs was born on May 15, 1909, at Cheswold, Delaware, the son of Edward Jefferson and Lettie Vaughn Boggs. He married Elizabeth Muir and had two children, Cale, Jr. and Marilu. The family were members of the Methodist Church. He graduated from the University of Delaware in 1931 and from Georgetown University Law School in 1937. In 1938 he was admitted to the Bar and began the practice of law at Dover, Delaware. During World War II, he served in the army with the 6th Armored Division fighting in Normandy, the Rhineland, the Ardennes, and central Europe. He earned five Campaign Stars, the Legion of Merit, the Bronze Star Medal with Oak Leaf Cluster, and the Croix de Guerre with palm from France. Boggs was appointed Associate Judge of the Family Court of New Castle County in 1946. He was elected to the U.S. House of Representatives in 1946, defeating incumbent Democratic U.S. Representative Philip A. Traynor. He won the election a total of three times, also defeating Democrats J. Carl McGuigan in 1948, and Henry M. Winchester in 1950. Boggs served in the U. S House from January 3, 1947, to January 3, 1953. Boggs was elected Governor of Delaware in 1952, defeating incumbent Democratic Governor Elbert N. Carvel, and won a second term in 1956, defeating Democrat J. H. Tyler McConnell. He served as governor from January 20, 1953, to December 30, 1960, when he resigned because of his upcoming U.S. Senate term. Boggs was elected to the U.S. Senate in 1960, defeating incumbent Democratic U.S. Senator J. Allen Frear, Jr. by 1.4 percentage points, and becoming the only Republican to defeat an incumbent Democratic U.S. Senator that year. He was again elected to the U.S. Senate in 1966, defeating Democrat James M. Tunnell, Jr., son of the former U.S. Senator. He served two terms from January 3, 1961, to January 3, 1973. As U.S. Senator he supported the Civil Rights Act of 1964. Boggs lost his bid for a third term in 1972 to Democrat Joe Biden, then a New Castle County Councilman. Boggs was a reluctant candidate that year, being persuaded to run only to help avoid a divisive primary election. Biden waged an energetic campaign and went on to defeat Boggs by approximately 1.4 percentage points. In his last years, Boggs lived in Wilmington, Delaware where he continued the practice of law. Boggs died at Wilmington and is buried in the Old Presbyterian Cemetery in Dover, on the grounds of the Delaware State Museum. The J. Caleb Boggs Federal Building at 844 King Street in Wilmington, Delaware is named for him. On an objective, senatorial level, Senator Boggs was a militant, but rational environmentalist. 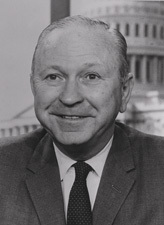 A co-sponsor of the National Air Quality Standards Act of 1970, Senator Boggs helped to win congressional approval of this bill, which was signed into law by President Nixon. Further, Cale Boggs was a co-sponsor and helped to write the Water Quality Act of 1965. In 1970, Senator Boggs helped to strengthen State authority to prohibit sewage and pesticide discharge into rivers and lakes and to provide for coordinated Federal attacks on river and lake pollution in the Water Quality Act of 1970. Through these and other vital contributions in education, medicine, agriculture, transportation, and other domestic concerns, Senator Boggs left an enviable record of legislation aimed at improving the quality of life of all Americans and at widening opportunities for all of our citizens. But, above all, Cale Boggs will probably be best remembered by his friends still serving in the Senate and by the people of Delaware as a friend, a man of warm humanity, and as a gentleman who sought ever to set people at ease through his common touch and deep consideration of other people's feelings. Cale Boggs was a man whose friendship one easily sought and, once secured, was long treasured. Elections are held the first Tuesday after November 1. The governor takes office the third Tuesday of January and has four-year terms. U.S. Representatives take office January 3 and have a two-year term. U.S. Senators are popularly elected and also take office January 3, but have a six-year term. Davis, Ned (2000). Charles L. Terry. Wilmington, Delaware: Delaware Heritage Press. LCCN 00133337. OCLC 47186751.